This MMI Center features a 7-inch retractable system that can tell you about navigation as well as providing handwriting-recognition technology right there on the console. The pre sense basic function can intervene when it senses that a vehicle is undergoing an unusual, possible emergency maneuver. Moreover, the pre sense front can help stabilize the car, preparing it for when it senses a potential front-end collision. 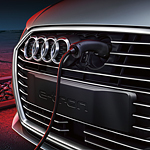 These both come standard on all Sportback e-tron models. Sound interesting? Call Audi Salt Lake City today and we will be happy to arrange for a test drive!